James Ehnes performed the Walton with the City of Birmingham Symphony Orchestra and the Brahms with the Royal Liverpool Philharmonic Orchestra, on the same day. The Guardian: "Ehnes’s fearless response to both works spoke for itself. The fine balance of Walton’s reflective lyricism and its capricious displays of technique were handled with flair, and the tone that Ehnes produced high on the E string lent a sweetness to the music too often lost in more effortful performances." Stephen Waarts performed works by Beethoven, Bartok and Ravel in recital with pianist Chelsea Wang. Washington Post: "Waarts showed an uncommon, preternatural sense of tonal color and lyrical beauty on the instrument." New York Times: "Mr. Waarts showed himself a technically accomplished and musically insightful artist, though he was most impressive in Bartok’s extraordinary Sonata for Solo Violin, completed in 1944, when the composer was fatally ill with leukemia." 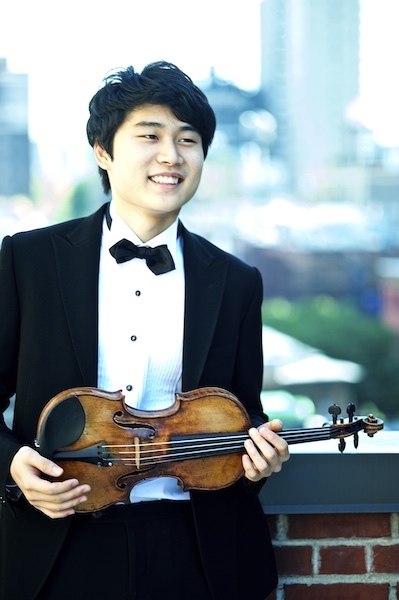 In Mo Yang performed Mozart’s Violin Concerto No. 5 with the Boston Classical Orchestra. Boston Globe: "From his first entrance onward, Yang was an arresting performer: now sweet, now excitable, now chaste, now florid, and always, everywhere, in command. Yang provided his own artful cadenzas, each showcasing his dexterity while also adhering to Mozart’s insuperable continuity." Stefan Jackiw performed Mozart’s Violin Concerto No. 5 and David Fulmer's Jubilant Arcs with the ProMusica Chamber Orchestra. Columbus Dispatch: "Jackiw’s no-holds-barred approach in the final movement’s intense “Turkish” section was electrifying, and his moments capturing Mozart’s playful transitions and more-refined and soaring lines were utter delights." Bloomington Herald-Times (paywall): "Schubert’s A Major Sonata (“Grand Duo”)... is a piece rich in melodies and opportunities for musicians to reveal their skill at quickness and buoyancy and verve. It received a fully engaged reading from two virtuosi who obviously love the music and know how to give it vitality and interpretive heat." Vadim Gluzman performed Prokofiev's Violin Concerto No. 2 with the Tucson Symphony. Green Valley News and Sun: "Gluzman’s sound was huge on his big 1690 Stradivari, and both his visual and physical communication with Hanson and the orchestra produced a symbiosis, always a certainty for performance perfection." Remus Azoitei performed the Tchaikovsky with the Philharmonic Chamber Orchestra of London. Music OMH: "Tchaikovsky’s violin concerto might be one of the great warhorses of the violin repertoire, but Remus Azoitei’s playing of it urged one to listen to it afresh and made me question how critic Eduard Hanslick could have ever thought it to be “music that stinks in the ear." Gil Shaham premiered David Bruce's Violin Concerto “Fragile Light” with the San Diego Symphony. U-T San Diego: "Shaham, who has been a frequent visitor to San Diego with the symphony and the La Jolla Music Society, has repeatedly shown himself to be a communicative soloist able to reveal the most human aspects of a wide range of music, from unaccompanied Bach to standard concerto repertoire. But he couldn’t find the humanity in Bruce’s piece." Jack Liebeck performed Bruch's Violin Concerto No. 2 with the BBC Scottish Symphony Orchestra. The Scotsman: "Liebeck took most of it in his stride and played a boisterous game of duck and dive with conductor Martyn Brabbins, whose control of the orchestral artillery – Bruch hits out with some meaty tuttis – was balsy and bright." In other news: Our apologies for missing a Grammy nominee last week! A big congratulations to the Turtle Island String Quartet, which was nominated for a Grammy in the "Best Classical Compendium" category for an album recorded with mandolinist Mike Marshal, called Mike Marshall & The Turtle Island Quartet. Reviewers DO use odd combinations; chaste isn't opposite of florid, nor sweet related to excitable...oh, well, sounds like Mr. Yang's was a good performance, regardless.